This healthy bran muffin recipe makes yummy moist muffins that are so delicious you won’t know they’re really nutritious too. The raisins add sweetness and moisture. The walnuts add crunch and even more nutrition. Stir together the bran, flour, soda and baking powder. Stir in raisins and set aside. Blend the milk, molasses, oil and egg. Add to the dry ingredients and mix just until moistened. Spoon into 12 greased muffin tins. Bake for 15 minutes at 400ºF or until muffins pull away from sides of cups. Replace the raisins with an equal amount of chopped dates for delicious date bran muffins. Replace the raisins with dried cranberries for a wonderful taste treat. A great combination is cranberries and blueberries. Use fresh or frozen blueberries and mix them with the flour so they don’t sink to the bottom of the muffins. Add 1/2 cup apple sauce for extra moisture and sweeetness. If you do this, use less honey. A high fibre bran muffin recipe like this one isn’t just good, it’s good for you. 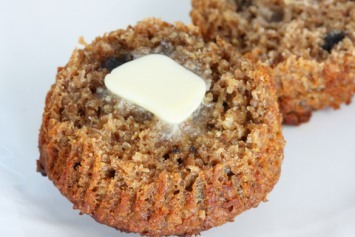 Made with whole wheat flour and wheat bran, this is a very healthy muffin recipe your family will love. This can be a great diabetes recipe for some diabetics. Most diabetics do best with some carbs, so you may be able to tolerate the carb count of this recipe. To make it a better diabetic recipe, I would replace the honey or molasses with stevia or coconut sugar, both MUCH lower on the glycemic index. Add more milk to make up the volume of liquid needed in the recipe. If you do that, the sugar replacement will make this a much better recipe for diabetics. Check out the CookingNook.com variations above for tips on how to vary this one basic recipe with simple ingredients. The chopped walnuts add crunch and extra nutrition. Look here for information about why walnuts are one of our 10 healthiest foods. If you like this bran muffin recipe, have a look at the rest of our delicious biscuit, muffin and bread recipes. Find your new favorites here. – a little more baking powder – almost a 1/2 teaspoon more. – a blend of ground flax meal, uncooked quick oats, and flour, in place of the last 1/2 cup of flour. – an extra 2/3 cup to 1 cup of milk (almond milk worked great too) that was mixed with 1 cup of All-Bran cereal. Set it aside to soak for a few minutes before adding it to the batter. – 1 unpeeled, grated apple. – 1/2 cup frozen raspberries — added just as the batter came together, before I spooned it into muffin pans. thank you! these were great with the applesauce and dates!